This is a fascinating tweet from the President. hanging tough and sticking to principle, and as he has said before, he is not going to support a socialist healthcare bill that simply shifts the cronyism from Democratic benefactors to Republican benefactors. But also, there is no name calling of Rand by Trump. He even states that Rand is a friend. Trump doesn't treat anyone else with such courtesy. 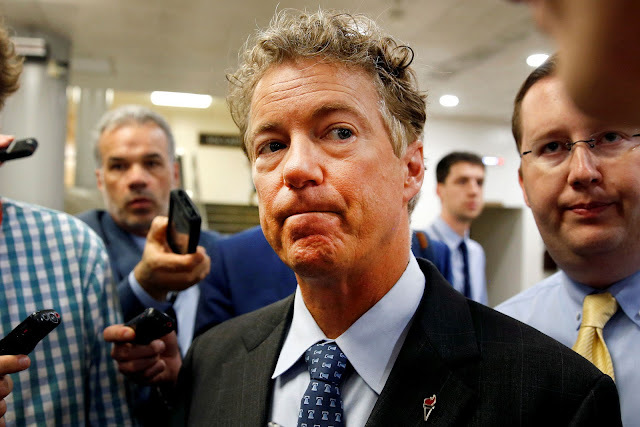 I think it is because Trump knows that Rand treats him with respect and just argues the issues rather than being a crony opportunist like other Senators and House members. It reminds me in some ways of the great economic policymaker Ludwig Erhard who could stick to principle toe-to-toe with anyone but still maintain the respect of his opposition. Rand sticking to his guns and upholding the Paul family name. People of KY should be proud to have him as their senator. I never thought Rand could pull off such a 180 from his Al Sharpton and wailing wall photo op days, not to mention dissing his father at the RNC and endorsing Romney. That seemed like an unforgiveable crime at the time, but he sure looks to be redeeming himself in a hurry. RW, you have done a great job following his 180 as you used to be his harshest critic (and rightly so) and the last few weeks you have really been effusive in your praise for him taking ballsy stands for the cause of liberty. And never have we needed it more! This tweet shows he is having an impact if Trump feels the need to call him out like this while still being cordial. Also, the anti-war stances have been amazing too. Before it was always about him doing showboat filibusters just to get headlines, but this protest he did to get all the senators to go on record as for or against the wars seemed like he was really trying to take a stand for peace, which is pretty much unheard of in DC these days. I'm sure these moves have been positively reinforcing for him and we are going to see more of this. Selling out your principles and your dad's legacy must be an exhausting enterprise, so I bet he sleeps better at night now too.